My goal is to successfully treat my patients while using a conservative approach without medication or surgery. David A. Reina, D.C., is board certified by the National Board of Chiropractic Examiners (NBCE). He received his Chiropractic Degree from Life Chiropractic College in Marietta, Georgia. Dr. Reina completed his three-year postgraduate studies in Clinical Neurology at the National College of Chiropractic in Lombard, Illinois. He completed his Internship in X-ray and clinical proficiency at Life College in Marietta, Georgia and Atlanta, Georgia. Dr. Reina has been in private practice since 1989. His special interests are in noninvasive pain management, restoration of function utilizing manual medicine and chiropractic techniques. Dr. Reina also spearheads the Orthopedic Total Wellness (OTW) program at Florida Orthopaedic Institute. He has been a guest lecturer on numerous occasions on the topics pertaining to Chiropractic techniques of treatment, and diagnostic pain management for pregnant mothers. 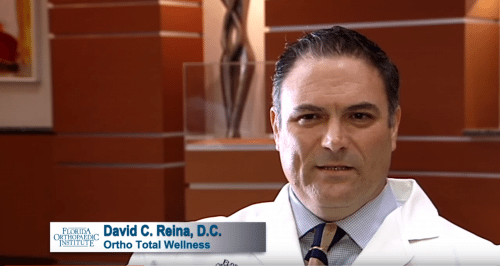 In his free time, Dr. Reina enjoys spending time with his wife and four children. Dr. Reina is knowledgeable and professional. I would recommend him to anyone with complete confidence. Dr. Reina is superb — he listens, explains and answers to any questions. Most importantly, he works magic! I have seen him for issues with headaches and back pain. My issues were resolved very quickly with one or two simple exercises, some adjustments, icing and kinesiology tape. I am so very grateful for Dr. Reina. Dr. Reina is absolutely fantastic and has an incredible knowledge of the human body as a whole. Not only does he take the time to give his thoughts about your medical condition or area of discomfort, but he takes the time to educate you on “why” you are feeling that way. His insight and vision to overall body movement is refreshing. He has been a big key for me in dealing with major back pain after having a total knee replacement six months ago. As a former pro athlete and head coach now for the last 14 years at a university, he is the best I have seen in providing a clear pathway to body wellness and movement. I would only trust Dr. Reina with my care and the care of family and friends. Dr. Reina knows exactly the issues, causes and treatment for his patients. Dr. Reina was able to figure out the source of my problem and treat it for relief. I refer everyone I know who could benefit from his competent practice and profession and caring manner. Dr. Reina is one of the best doctors I have ever had. I laugh during my visits as he fixes my problems with such ease. It is amazing what he can do. If you are in pain or have back problems, Dr. Reina can heal them all. Amazing doctor. There aren’t enough words in the English language to accurately describe my satisfaction with Dr. Reina. The time he takes to listen and research and understand the various ailments I have is unlike nearly every other doctor I have seen. He’s truly helped me and I’ve already sung his praises to anyone that will listen! Dr. Reina is amazing! I’ve had so much success in easing my pain that I brought my daughter in to see him. She has now become a patient of Dr. Reina’s also. Dr. Reina takes great concern with his patients and truly does all he can to help us. I wouldn’t see any other chiropractor but him. He’s an asset to Florida Orthopaedic Institute. I can’t say enough about Dr. Reina and Tammy. I had been having a non-stop headache for over 9 months. I had seen several specialists that tried nerve blocks, medication, referred me to a pain management center – I was referred to Dr. Reina through my massage therapist. After seeing Dr. Reina the first time, my headache was pretty much gone. It came down to opening the blood flow and adjusting my jaw. After 6 sessions, I have been good ever since. We scheduled an appointment for follow up in a month if needed. They both listened to me and I felt so grateful for the time they spent with me and the results I achieved through minimal treatment and no medication. I had suffered intense pelvic floor pain for six plus years with multiple visits to urologists, pelvic floor therapists, chiropractors, and an acupuncturist. At best I had only received minimal, short term relief. On my very first office visit with Dr. Reina I knew he was onto something. On my second visit that was confirmed and now on my fourth, my overall pain has diminished so much that I cried from relief. Dr. Reina’s concern for me and his ability to diagnose and treat me with such amazing success in such a short time is nothing short of miraculous. I thank God for the healing that has come and encourage anyone that needs help to come see him. Finally! Thank you Dr. Reina for helping with my vertigo. I have spent the last couple years searing for someone to help me. I have had X-rays, MRI’s, and multiple other tests with no relief. I walked out of Dr. Reina’s office feeling so much better. My vertigo is GONE! I had suffered with intense pelvic floor pain for six plus years with multiple visits to urologists, pelvic floor therapists, chiropractors and an acupuncturist. At best I had only received minimal, short-term relief. During my very first office visit with Dr. Reina I knew he was onto something. During my second visit that was confirmed. Now, after four visits, my overall pain has diminished so much that I cried from relief. Dr. Reina’s concern for me and his ability to diagnose and treat with such amazing success in such a short amount of time is nothing short of miraculous. I thank God for the healing that has come and encourage anyone that needs help to come see him. I cannot say enough about Dr. Reina and Tammy. During my first appointment, both of them took the time to get all the background information on what had been going on. I had been having a non-stop headache for over nine months. I had seen several specialists that tried nerve blocks, medication, referred me to a pain management center – I was referred to Dr. Reina through my massage therapist. After seeing Dr. Reina the first time, my headache was pretty much gone. It came down to opening the blood flow and adjusting my jaw. After six sessions, I have been good ever since. They both listened to me and I felt so grateful for the time they spent with me and the results I achieved through minimal treatment and no medication. I went into the FOI Urgent Care Center with lower back pain. After x-rays and a talk with the practitioner on duty that day, I was referred to Dr Reina, DC. I was skeptical that a chiropractor would really help me, but on my first visit I realized that my skepticism was unfounded. Dr. Reina is thorough and very knowledgeable and he helped me with the pain in my lower back and also addressed a problem that I had (that I was not aware of) with my balance. He shared exercises with me that are better for my back that I have incorporated in to the bootcamp classes that I teach. My back feels so much better! I’m so glad that I went to Dr Reina and I will call him again if I have any more back issues. I have had several knee surgeries over the past three years and since my last one two years ago; I have had numbness in my foot. After having numerous tests and seeing several doctors, including a neurologist, I was left with “the feeling might come back or it might not.” No one could tell me if there was anything I could do to get the feeling back in my foot. Dr. Reina came highly recommended and I made an appointment. After a very thorough examination, Dr. Reina conducted a procedure on me that gave me feeling in my foot for the first time in two years. I am blown away at the fact something that took him a few minutes to conduct could fix something that numerous doctors and tests could not handle over several years. I am very thankful for Dr. Reina, as my quality of life will now be exponentially better than it has been. I had heard about Dr. Reina for about a year and a half before finally deciding to schedule an appointment with him. I am so very glad I did, and wish I would have begun treatment when I first heard his name! I was diagnosed (after years of being misdiagnosed) February 2011 with Multiple Sclerosis. I feel confident that his treatment has improved my balance and walking challenges. I walked in my first appointment with a brace, which I was using all the time and had reconciled that this was going to be part of my new world. I left that appointment with the brace in hand and only use it for outings that involve lots of walking. He is a man of faith, integrity and intelligence who deeply cares about his patients. I am blessed to have him as part of my wellness team! I have had a pain in what I thought was my right hip for more than 5 years. I have had x-rays taken and even an MRI and they kept saying there was nothing wrong with my hip. My doctors could not find anything but the pain kept getting worse and worse to the point where I could not walk 25 feet without having to drag my leg due to the pain. It felt like bone on bone in my hip and severely limited my mobility. My doctor recommended I go see Dr. Reina who has a chiropractic practice at the Florida Orthopaedic Institute. I had never been a big fan of chiropractors so I was hesitant but the pain was intense and I was tired of not being able to walk very far so I decided to go. I can’t tell you what an idiot I have been to wait all this time to go see Dr. Reina. My brother has been telling me for years to see a chiropractor but I didn’t listen. During the first visit after my examination Dr. Reina told me the problem was not in my hip. I had a lower back problem because I was walking incorrectly with my left leg and it was over stressing the right side of my lower back which was causing the severe pain. He gave me an adjustment, some stretch bands and showed me a couple of exercises to do with my feet. (At this point I should mention that I have severe COPD and pulmonary hypertension which means my feet, ankles and legs are always swollen tight as a drum.) He had me walk after the adjustment and I could not duplicate the pain no matter how much I walked. I figured it would come back for sure so I left and they scheduled an appointment for 3 or 4 days later. I told the Dr. that I bowled on Mondays and he told me to go ahead and bowl. When I went back to see him I told him I had no pain walking during the week but after bowling my back tightened up. It was not the same pain but it still hurt. He said I’m walking better now and the exercises are working so keep doing them. He told me I just strained some muscles I had not been using during bowling and then gave me a different type of adjustment and the pain went away. I walked almost 2 miles last Saturday, pain free. I cannot thank Dr. Reina enough! All those years of pain and he corrected it so quickly I still find it hard to believe. If you are a doubter in Chiropractors, as I was, and you have pain — go see Dr. Reina. Don’t be an idiot like me and suffer unnecessarily. This guy knows what he’s doing. Don’t be afraid to give it a try. Patients with knee replacements should definitely consider chiropractic as part of their rehab. I had a total knee replacement of my right knee by Dr. Bernasek. The surgery and physical therapy were great, but I was still having a few “issues” that I thought needed a chiropractor’s attention so I went to see Dr. Reina, a Florida Orthopedics Institute chiropractor. He helped me and my knee rehab/recovery immensely. My hips had become slightly crooked and my balance was off. He corrected both and I was able to get greater benefit from the physical therapy for my knee. I am now stronger and can walk better because I no longer have to work at balancing myself in between steps. My overall improvement has been phenomenal. I highly recommend seeing Dr. Reina as part of your knee rehab. After many years of receiving different diagnosis from various doctors including TMJ to Cervical Dystonia and being prescribed and collection of pain / muscle relaxers, it was suggested by a fitness colleague of mine to visit Dr. Reina. With consistent headaches, neck and back ache taking a toll on my every day life, I scheduled an appointment thinking I’ve tried everything else, why not try another? The initial new patient consolation is worth every bit of the wait, simply because the same amount of care and time from Dr. Reina and his assistant shall be spent with you. Initially my treatments were every 3 days, then 5 days, then a week, then 2 weeks and after approximately 3 months…Care and treatment at it’s very best with positive results. I have no longer have neck, back and headache issues, and continue to check in with the good Dr. periodically. He’s impressive, I have referred Dr. Reina to friends whom have been thrilled with their own results. I’m going with genuine.